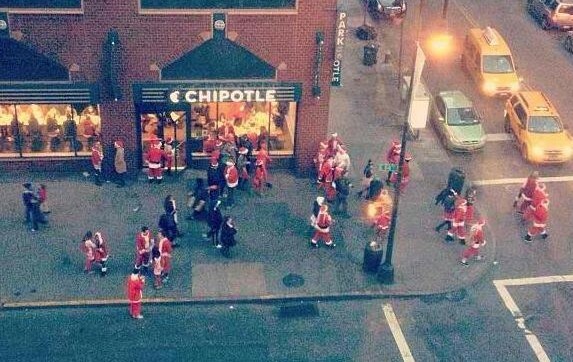 As the first official snowfall of the season accumulates on the streets of Manhattan, thousands of what I like to call “Frat Santas” have descended on our fair Metropolis to participate in the annual Pub Crawl ritual known euphemistically as SantaCon. Dressed in the manner of Santa Claus (give or take a White Beard or Red Hat) these people have only one goal: to get as wasted as possible while disguised as Jolly Old St. Nick. Be forewarned: As you navigate the sidewalks and gutters, be wary of spontaneously created piles of fresh yellow snow and be extra careful not to slip in the Times Square Eggnog!